There is almost nothing as good as a Retro Tuna Macaroni Salad! This recipe brings back the tastes of your childhood – it’s just like Grandma used to make, with a healthy twist! ( or not, don’t worry, you can still make this the normal way!) Read on to find out! 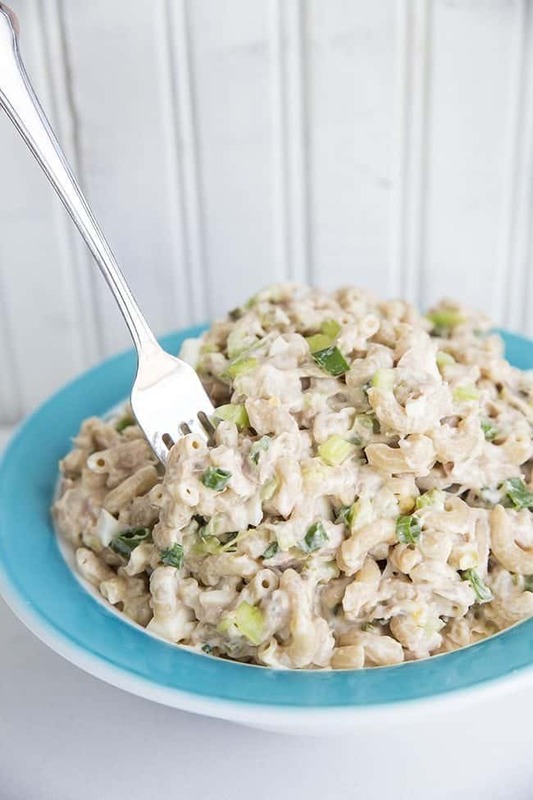 Tuna Macaroni Salad is a Classic For a Reason! Can I be sad that i am the only one in my family that eats tuna? Yes, it’s true! 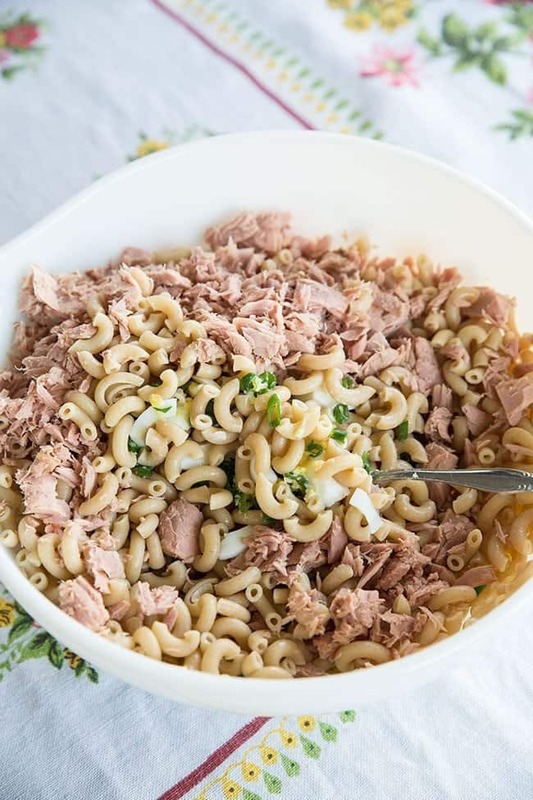 I can only make this when I have company over that over tuna macaroni salad as much as I do – that’s pretty much my other family members like my sister and my mom. As I’m sure you know by now, I am a big fan of using whole wheat or grain-filled pasta whenever you possibly can in dishes. Sometimes you do need a glorious white pasta (decadent mac n’ cheese is a perfect example of this) but most times a dish and your health can benefit from substituting in a whole wheat or whole grain based pasta. We have been avid whole wheat/whole grain pasta lovers for over a decade now, starting our own conversion over when my 12 year-old was young. The kids now actually prefer whole grain pastas, as do Mike and I. There’s something so toothsome about them that I really enjoy. Summer time is on the way and I’ve oddly been dreaming about making a retro tuna macaroni salad. I love an amazing picnic salad and a tuna macaroni salad has been on my to-make list for as long as I can remember. 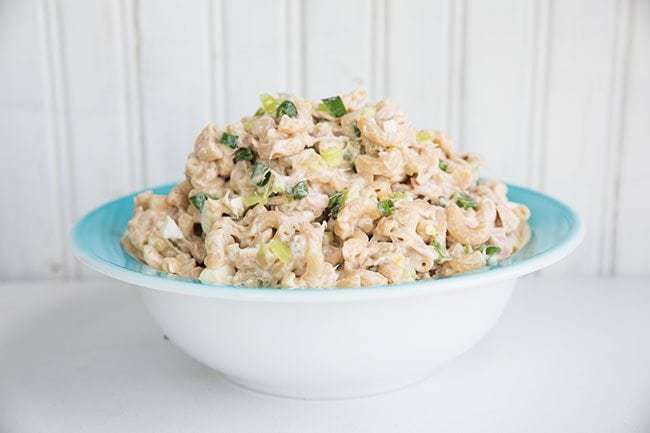 What better time to try out new Catelli Ancient Grains macaroni than with my own twist on this time-tested classic – retro tuna macaroni salad? 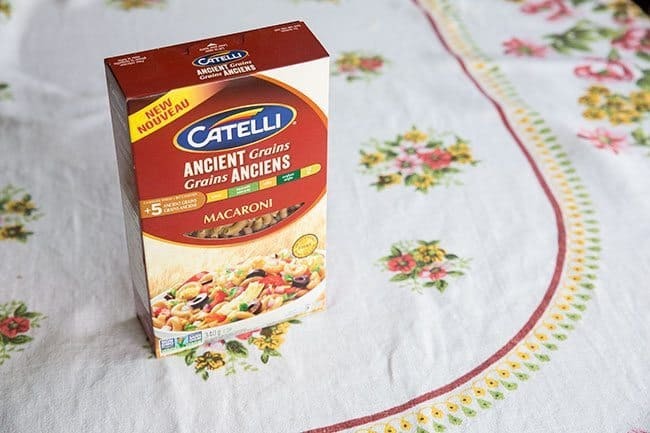 Catelli Ancient Grains is the only 100% whole grain pasta of its kind, with a deliciously different, yet mild flavor. The five grains included in the pasta are quinoa, teff, amaranth, millet and sorghum. It’s also made with 100% all-natural, whole grain Canadian wheat, which as you can guess is very high in healthy fiber for us all! This line of pasta is only available in Western Canada right now. What ingredients are in tuna macaroni salad? Now, does the sight of this bring back memories of church picnics and potlucks of your youth? Oh, it sure does for me! Tables groaning under the weight of delicious delights and there were always at least four or five different pasta salads! I would usually look for the tuna one, for even as a child I absolutely loved tuna in all forms. Now, I do make mine a little different. I think tuna always needs some dill pickles to cut the richness of the fish itself, not to mention in a mayo-based salad you definitely need the acid in there. I also have another secret to this salad’s success – and this is a family trick for sure- use half mayo and half whipped salad dressing. The tuna needs the tangy dressing, absolutely. While I am usually a mayo purist, in this salad, whipped salad dressing is the only way to go. Well, at least for half of it! You can customize the salad any way you like, from adding olives – which is the ultimate retro tuna salad!- which also add that acidity to cut through the richness. I added a lot of green onions since I love them, around 2 stalks of celery because I wanted a lot of crunch…the possibilities are endless. Mix, match and customize until you have a salad that you love! While this post was generously sponsored by Catelli, all opinions and the recipe remain my own. 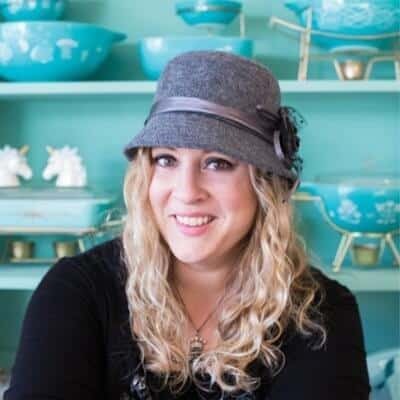 PIN this photo to your SALADS Board and Remember to FOLLOW ME ON PINTEREST! 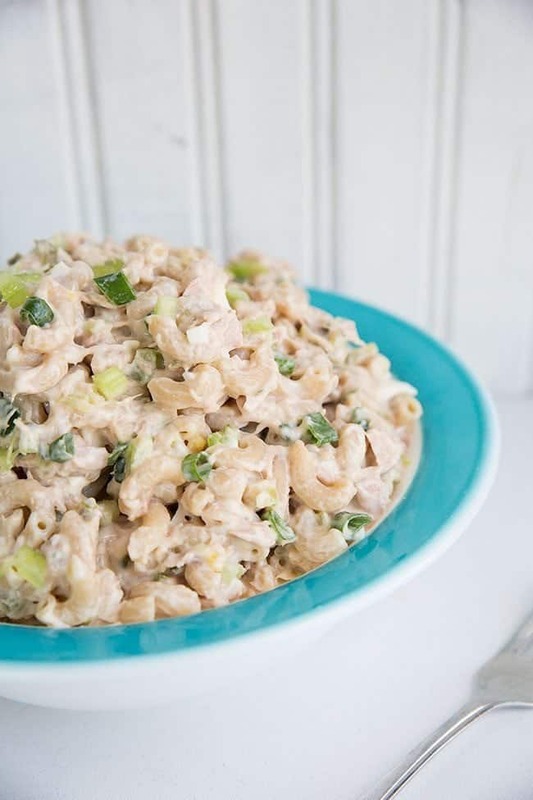 Retro Tuna Macaroni Salad just like mom used to make, fast , easy and delicious! My secret is to add pickles to give it a great tangy taste! 2 oz cans of tuna drained well 8 . In a large mixing bowl, combine the pasta, eggs, celery, pickles, green onions and tuna. Toss with a fork to combine. In a measuring cup, mix the mayo, whipped dressing, relish and pepper Taste and add more relish or pepper as needed. Pour the dressing over the macaroni and stir gently to combine. Try olives, they are delicious and totally retro! Hi, looks fabulous. But I too am wondering about the quantity of tuna. That line in recipe looks like it got scrambled a bit. Also 1 gm pasta does not make sense. Can you clarify? Thanks in advance! This brought back memories! Making this tomorrow. However, I’m kinda confused. When you get to the tuna, it says “2 oz cans of tuna”. Do you mean “two” 2 oz cans, or just a “2 oz can”? Please clarify. delicious just like i remember …..i add crushed regular chips on top like my grandma used to do!!! love love this recipe so much 🙂 old school is always better…..
Oh, my goodness! You must have grown up like I did, just 20 years later! 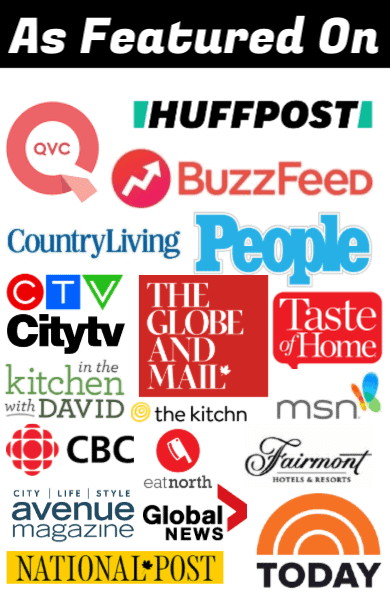 I see so many familiar recipes on your site that I have long forgotten but should find their way back in my repetoire. Those are the best recipes, the ones from our childhoods! This is a lot like the one I make, and if you want to kick it up a notch, add a sprinkle of celery seed. It gets in your teeth, but oh the celery flavour! !